Hailing from the Czech Republic, Arthedain, like many newer and/or younger and/or fresher bands, haven’t quite mastered the art of a “song.” When you are capable as such writing riffs and melodies within the melodic black/death frame, it’s quite easy to fall into the labyrinthine song construction trap, of which takes a rather strong hold on the band’s first full-length, Infernal Cadence of the Desolate. The melodic black/death tip-off typically lands in Dissection territory and Arthedain (who comprise of vocalist/guitarist/bassist Charles Wolford, guitarist Nicholas Colvin and drummer Tobias Schuler) are no exception at various points, specifically the snapping opening moments to “Arcane Ascension.” To wit, the band’s melodies aren’t totally black nor are they ripped from the vast confines of Gothenburg. Instead, they’re somewhere between tremolo bashing and the Finnish realm occupied by Insomnium. It’s a healthy combination that brings forth rewards on “A Testament to Failure” and album highlight “A Garden Lies Barren,” the latter, a blinding, whirling number akin to Naglfar when they were still formidable, which, sadly, was about two decades ago. 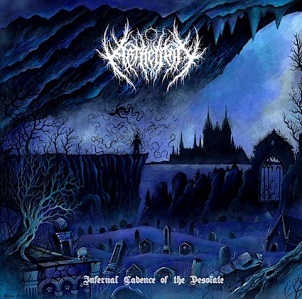 Infernal Cadence of the Desolate features more than enough winding and toppling songs for Arthedain to establish themselves. The only problem is that it seems like they’re somewhat caught in the margins and not exactly sure what to do the proliferation of ideas at their disposal. It’s the sign of a young band still finding its feet.